This payroll program is an Excel VBA macro that calculates wages for an unlimited number of employees. The program calculates withholding (using the percentage method), FICA, and medicare taxes. In addition, bonuses, child support, wage draws, and miscellaneous fees can be deducted. The macro prints a pay stub for the employee as well as a copy for the employer. 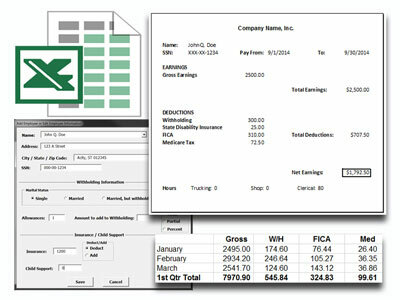 A summary feature is also available that computes quarterly/yearly totals for the company and each employee, and prints W-2 sheets.